We just released GigaTribe communities. If you are a fan, a photographer, a gamer, a Mac user 🙂 … join your community right now and meet new Tribers who share the same passion! 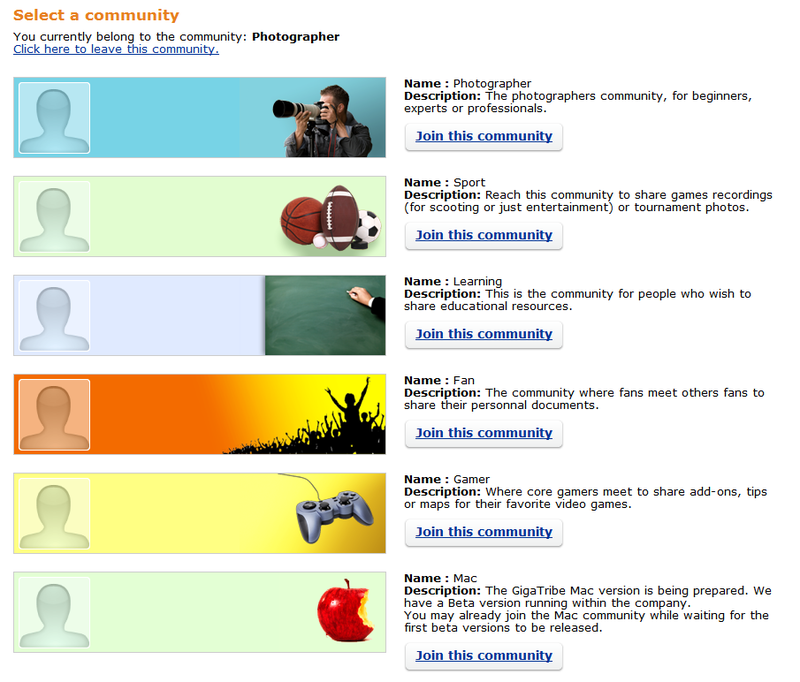 You can access the list of communities directly from GigaTribe 3.19 via the “news” tab. You may switch anytime from one community to another, as often as you wish. Just choose one to start with! More information about communities on our website. This entry was posted in Version 3 release by D1FFER. Bookmark the permalink. Good to see there will be a MAC version soon. Will this also mean that a LINUX (Ubuntu) version will be released? I hav downloaded the software and now I want to join how do I do that? Now you are connected to GigaTribe, you need to invite people in your network. You can use the “open inviter” to invite your friends to share with you on GigaTribe; on your private area (http://www.gigatribe.com/en/account) or directly via the software (click the + button). Our facebook application is here as well to help you find new friends on GigaTribe. It’s available via your private area (http://www.gigatribe.com/en/account). I hope you will enjoy GigaTribe!